Looking for a gooseneck hitch for your full-size truck? 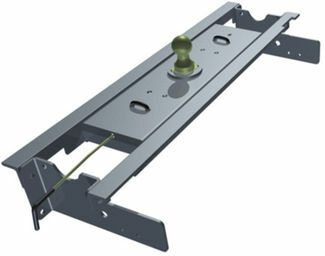 The B&W Turnoverball Gooseneck Hitch and Curt Double Lock Gooseneck Hitch are both market leaders because of its unique features and quality build. All Turnoverball hitches feature a hitch ball that will remove and flip over to give you a flat surface in your truck bed when not towing a trailer. 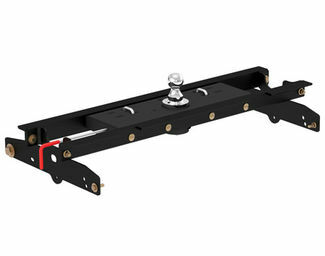 Proudly built in the United States of America, these hitches feature the highest quality craftsmanship and material of any RV hitch on the market. B&W hitches are the best selling gooseneck hitches in the country. Why do so many people trust the B&W hitches to tow their most precious cargo? Here a breakdown of the features and benifits to choosing B&W. B&W Turnoverball gooseneck hitches are custom built for each truck application. This means a simple installation for most all full-size trucks. Existing holes are used on nearly all applications, requiring you to drill just the the 4 inch hole for the hitch ball. No bed removal is needed. One large drawback to traditional gooseneck hitches is you have plates and a hitch ball permanetly or semi-permanetly in your truck bed. This limits how you can use your truck bed. In 1988 B&W released their Turnoverball design and changed the hitch market forever. B&W Turnoverball hitches give you the ability to remove the hitch ball and turn it over to have access to a flat surface truck bed. Simply release the included spring loaded latch and flip over the ball and you are done. B&W takes extreme pride in that all their hitches and accessories are American built. They believe in American manufacturing and use only the finest American steel, tubing and ASTM Welding Standard. You can trust the quality is second to none. What if you own a 5th wheel trailer and would like to have the Turnoverball advantages? 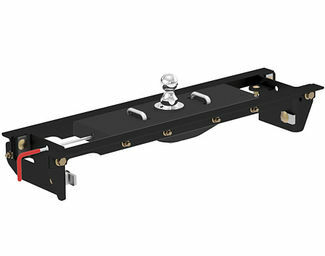 B&W offers a full-line of Companion 5th Wheel hitches that utilize the Turnoverball hitch system for mounting. This means no in-bed rails to mount! The Companion can be removed in minutes to also give you a flat surface truck bed. B&W feels so strongly about their quality they stand behind their products with a limited lifetime warranty.